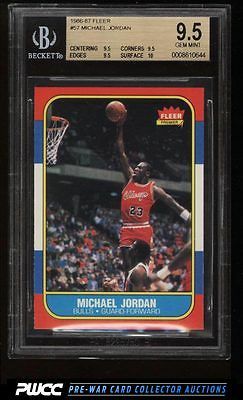 *Auction 7, Modern Round 2* Easily among the finest Michael Jordan rookies in the hobby and virtually impossible to improve upon. A pack fresh masterpiece which boasts incredible pristine surfaces as well as GEM MINT centering, edges and corners. This comes highly recommended by PWCC and is deserving of the best collection. One of nearly 20,000 cards, lots, and sets up for bid in our 7th Auction of 2016. Click on the link above to view the other PWCC auction lots.